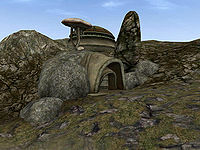 Sanni is a Velothi tower located on an island to the west of Ald Daedroth. If you ask for rumors in Tel Mora or Vos, you will hear about a boatful of rogue Telvanni heading up the coast. This is the Velothi tower they took over. 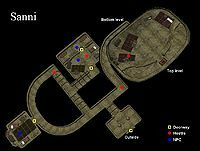 The occupants are hospitable if you are Telvanni yourself, with some beds you can sleep in. There is a little chapel for Ancestor worship, complete with the books on the topic. Sanni has no quest ties. There is a full set of Master's alchemical gear here and several containers of ingredients, as well as a significant amount of expensive alcohol.